Big with barely a bezel. Monitor makers have pulled themselves out of the rut they were previously stuck in, the one where display innovation topped out at 30 inches with a 2560x1600 resolution. 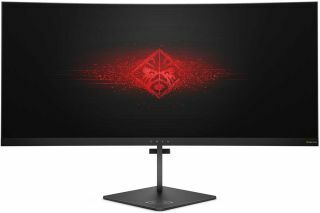 There are actually some interesting releases these days, among them HP's new Omen X 35. Built for immersive gaming, the Omen X 35 is a 35.03-inch curved monitor with a UWQHD (3440x1440) resolution, 100Hz refresh rate, and 1,800R curvature. The 21:9 display offers 34 percent more screen real estate than a 16:9 display. The display uses an AMVA+ w/LED backlight panel. This also happens to be HP's first monitor with Nvidia G-Sync support for smoother gameplay, provided you own a GeForce graphics card. Either way, it also boasts a fast 4ms response time to keep motion blur from being a distraction. The Omen X 35 has a rated 2,500:1 typical contrast ratio and 10,000,000:1 dynamic contrast ratio. It's tough to take rated specs at face value, but if accurate, the Omen X 35 should be able to deliver both bright and vibrant colors and deep blacks and shadows. Additionally, HP says the monitor offers 100 percent coverage of the sRGB color space. HP went with a virtually bezel-free design on the sides and top. Around back are three USB 3.0 downstream ports, HDMI and DisplayPort inputs, a headphone jack, and an audio port. There's also a headphone hook to store your headset on the monitor. It seems like an overall swank monitor, though also pricey—the Omen X 35 will be available in March for $1,300.